The SSV-33 Ural was a gargantuan nuclear-powered vessel launched in 1983. Equipped with state-of-the-art reconnaissance technology, it was one of the most advanced craft of its day. Yet the caprices of history meant that it was ultimately destined for obscurity. It was from construction berth ‘A’ of Leningrad’s (now St. Petersburg’s) Baltiysk shipyard, where aft sections of the French “Mistral”-class amphibious assault ships are now being built for the Russian Navy, that an extraordinary vessel slid down the slipway in 1983. It was comparable in its dimensions to the Orlan-class heavy Soviet nuclear cruiser and similar in displacement tonnage to the aircraft carrier Admiral Gorshkov, launched a year earlier and which in November 2013 set course for India after conversion to serve as the flagship of the Indian Navy, under the name Vikramaditya. The triple-masted Soviet vessel was 265 meters long (four meters longer than the French aircraft carrier Charles de Gaulle) and 30 meters wide. While it had no missile systems or flight deck, its size and the inclusion of a radar dome indicated its strategic designation. After the adoption by the United States of the concept of a “decapitation strike” (a pre-emptive nuclear strike that aims to knock out the enemy’s command and control capabilities) in the early 1970s and the modification of U.S. forward base systems in Western Europe, tensions with the Soviet Union intensified once again. In 1979 the decision was taken to deploy 572 Pershing-2 missiles in Europe, creating further unprecedented pressure on the Soviet Union to monitor potential launches of ballistic missiles from any point on the globe. Soviet intelligence focused attention on Kwajalein Atoll, 3,900 kilometers south of Honolulu, which became the U.S. test ground for anti-missile defense systems, Minuteman intercontinental ballistic missiles and the new Peacekeeper missiles. However, the Soviet Union had neither naval bases nor electronic surveillance facilities (like the Lourdes spy base on Cuba) in this part of the world. It was this reality that in the 1970s compelled the Soviet leadership to consider equipping a giant reconnaissance vessel with extensive autonomous (i.e. nuclear powered) capabilities to operate off the coast of the U.S. and the atoll test grounds in the Pacific. Such a ship would be capable of gathering data on any sub-orbital objects in flight anywhere in the world. And so Project 1941, or “Titan”, was born, implemented on one of the most unusual ships in naval history, the SSV-33 Ural. 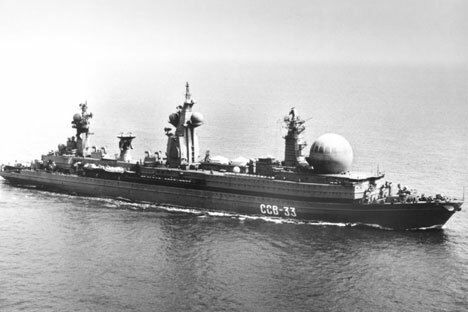 The ship’s primary weapon was the “Coral” radio-reconnaissance system, which had been under development by the Vympel (“pennant”) scientific production center since 1975. Its seven powerful constituent radio electronic systems and a number of ES-1046 and Elbrus super computers were designed to track missile launches, determine the type of rocket, range and launch site and target coordinates, payload weight and telemetric data, even down to the chemical composition of the rocket fuel used. This unique complex of systems could pinpoint any target, monitor communications channels, track satellites and identify the specifications of any spacecraft from a distance of 1,500 kilometers. More than 200 scientific institutes, design bureaus, factories and other organizations were involved in constructing Titan, which was essentially a floating base where numerous specialists gathered and analyzed data in various laboratories. The ship had a crew of almost 1,000, and, besides its military and scientific functions, had billiard rooms, sports halls, cinemas, two saunas and a swimming pool. After fine-tuning work was completed in 1988, the Ural went into service as the flagship of the reconnaissance section of the Pacific Fleet. On September 20, 1989 a Japanese Foreign Ministry cable reporting “an enormous nuclear vessel of unknown specification west of the island of Okinawa” revealed to the world the arrival of the reconnaissance behemoth at its permanent station. All on-board systems were tested during the voyage from the Baltic Sea to the Far East, pinpointing from 1,000 kilometers away the launch from the United States of the space shuttle Columbia and two electro-optical and spy satellites deployed under the U.S. Star Wars program. However, the Ural was destined never to reach Kwajalein Atoll. Its initial period of teething troubles coincided with the collapse of the Soviet Union, when even the most thoroughly tested and trusted vessels lost their combat readiness during long mooring periods. Moreover, the infrastructure needed to maintain the Titan had not yet been built and it had to be left at anchor running on its electrical reserves. The Ural monitored the entire northern part of the Pacific Ocean, intercepting radio communications by the air force and navy and submarine defense of the United States and Japan. But its fortunes went steadily downhill from there. In 1990 a faulty cable ignited a fire in the aft engine room and in 1992 both reactors were finally shut down. Thereafter, this unique ship, unparalleled by any other, was used as a hostel for the fleet’s junior officer corps and was irreverently nicknamed the “bunkbed carrier”. After one active tour of duty, the ship was decommissioned in 2001 and moored on a remote wharf beside the missile cruiser Admiral Lazarev (formerly the Frunze) before it was sent to the scrapyard in 2010.